The 4GB harmonica-shaped SoulFlash™ USB Flash Drive captures the FlashHarp's distinctive "freewheelin'" style! If you're looking for a unique 4GB flash drive at a great price the 4GB "SoulFlash" from Backyard Brand® is the flash drive for you. Maybe you're a professional Blues act and want a relevant way to deliver harmonica content. Or, maybe you just love the harmonica, or want a flash drive you can wear as a necklace. Maybe you just can't keep track of whose flash drive in the house belongs to who anymore and you want one with lots of surface area you can write on! The SoulFlash is the perfect solution! Translucent plastic box with magnetic latch included! SoulFlash's shape captures FlashHarp's likeness plus has front and back surfaces perfect for Sharpie autographing! 2½" long x 7/8th" wide x 3/8th" high. Sturdy slot at end will easily accommodate any lanyard (not included). Note, while SoulFlash has harmonica shape it is not playable because it is not an actual musical instrument. 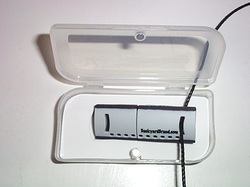 Want a harmonica USB drive that does play, that is a musical instrument? Those are called "FlashHarps" and you can explore that option here. Whatever you choose, Backyard Brand® is the place to come for a flash drive in the harmonica style! Need the SoulFlash in large quantities? Contact me!